South Korea culture - the traditional Suwon Dance is a traditional Korean dance that was performed during the planting and harvesting seasons. In modern day South Korea, it is now performed during festivals and special village holidays. 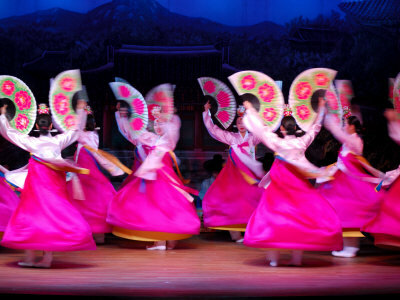 The Suwon Dance or the otherwise known as The Farmers Dance is thought to have originated in the Three Kingdom Period. 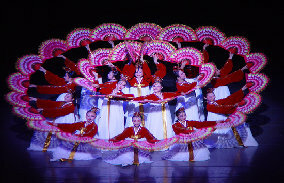 South Korea culture - the traditional Bucheachum Dance, is commonly referred to as the "Fan Dance". The traditional dance dates to early Shaman rituals that can be traced back to the "Chosen Dynasty" (1392-1910 AD). The dancers use painted fans decorated with exquisite peony blossoms and vibrant traditional Korean clothing, as they gracefully glide across the dance floor; portraying summer blossoms swaying gently in the wind. This dance is apart of the ancient Korean culture and tradition and is continued to be performed, during celebration, festivals, and traditional Korean holidays. South Korea culture - the traditional Taepyungma Dance, means the "Great Peace Dance". It is suggested that this ancient Korean Dance originated during the Joson Dynasty, and performed for Kings and Queens of the Korean Empire. Therefore, the costumes worn today by the dancers are similar to the "Gwanboki", which means "The Official Clothing". Formerly worn by Kings and Queens of the Korean Royal Court.